Clinoptilolite is a natural zeolite with high adsorption capacity for polar mycotoxins such as aflatoxins. The efficacy of clinoptilolite in ameliorating the toxic effects of aflatoxicosis has been proven in monogastric animals, but there is no such evidence for ruminants. 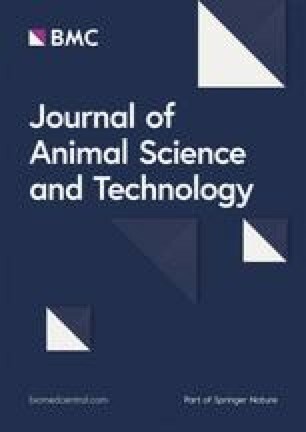 The aim of this study was to evaluate, under field conditions, whether the dietary administration of clinoptilolite in dairy cows could reduce the concentration of aflatoxin M1 (AFM1) in bulk-tank milk, in farms with higher than or close to 0.05 μg/kg of milk (European maximum allowed residual level). An objective of the present study was also to investigate the effect of particle size of clinoptilolite on aflatoxin binding. Fifteen commercial Greek dairy herds with AFM1 concentrations in bulk tank milk ≥0.05 μg/kg were selected. Bulk tank milk AFM1 was determined prior to the onset and on day 7 of the experiment. Clinoptilolite was added in the total mixed rations of all farms at the rate of 200 g per animal per day, throughout this period. Two different particle sizes of clinoptilolite were used; less than 0.15 mm in 9 farms (LC group) and less than 0.8 mm in 6 farms (HC group). Clinoptilolite administration significantly reduced AFM1 concentrations in milk in all farms tested at an average rate of 56.2 % (SD: 15.11). The mean milk AFM1 concentration recorded on Day 7 was significantly (P < 0.001) lower compared to that of Day 0 (0.036 ± 0.0061 vs. 0.078 ± 0.0074 μg/kg). In LC group farms the reduction of milk AFM1 concentration was significantly higher than HC group farms (0.046 ± 0.0074 vs. 0.036 ± 0.0061 μg/kg, P = 0.002). As indicated by the Pearson correlation, there was a significant and strong linear correlation among the milk AFM1 concentrations on Days 0 and 7 (R = 0.95, P < 0.001). Dietary administration of clinoptilolite, especially of smallest particle size, at the rate of 200 g per cow per day can effectively reduce milk AFM1 concentration in dairy cattle and can be used as a preventive measure for the amelioration of the risks associated with the presence of aflatoxins in the milk of dairy cows. Aflatoxins (AF) are hepatotoxic and carcinogenic secondary metabolic products from fungi belonging in particular to the Aspergillus flavus and A. parasiticus species [1, 2]. Aflatoxin B1 (AFB1) is of major concern in dairy cattle. When fed to lactating animals, a part of this AF is destroyed in the rumen, whereas the absorbed quantity is rapidly oxidized mainly to aflatoxin M1 (AFM1) [3, 4, 5]. Most of the AFM1 produced is excreted in the urine and less so in the milk [6, 7]. The carry-over of AFB1 to AFM1 in milk depends on many factors such as milk yield and days in lactation [8, 9, 10, 11] and ranges between 1 % and 6 % [11, 12]. As AFM1 is a possible human carcinogen , many countries have applied a maximum residue level for this aflatoxin in ruminant milk. For the EU this level is 0.05 μg/kg . In dairy farms milk AFM1 concentration often either approaches or exceeds the aforementioned maximum residue level. In these cases it is common practice to add a mycotoxin binder in the ration until the detection and withdrawal of the contaminated feed. The role of these binders is to adsorb and reduce the intestinal absorption of mycotoxins to reduce the toxic effects for livestock and the carry-over of toxin compounds to animal products. Clinoptilolite is a natural zeolite, licensed by the EU as additive in feedstuffs of farm animals . This material has high adsorption capacity for polar mycotoxins such as aflatoxins [15, 16, 17]. Concerning AFB1 specifically, it has been determined that 1 g of clinoptilolite can adsorb about 200 μg of this aflatoxin . The efficacy of clinoptilolite in ameliorating the toxic effects of aflatoxicosis has been proven in monogastric animals, especially in poultry [18, 19, 20, 21, 22, 23]. Such trials scarce from the available literature for ruminants and there is no reference providing information about the potential use of clinoptilolite as aflatoxin binder in dairy cattle. However, the use of other alumonosilicate binders closely related to clinoptilolite such as hydrated sodium calcium aluminosilicate was proven to be effective in reducing AFM1 in milk of cattle  and goats  in experimentally induced aflatoxicosis. Based on this evidence, the present study was designed in order to evaluate, under field conditions, whether the dietary administration of clinoptilolite in dairy cows could reduce the concentration of aflatoxin M1 (AFM1) in bulk-tank milk, in farms with higher than or close to 0.05 μg/kg of milk (European maximum allowed residual level). An objective of the present study was also to investigate the effect of particle size on the mycotoxins binding capacity of clinoptilolite. The study was conducted in 15 commercial Greek herds with Holstein dairy cattle that had high concentrations of AFM1 in bulk tank milk (close to or higher than 0.05 μg AFM1/kg of milk), as detected at the routine analyses by the dairy industries collecting the milk. Milk AFM1concentration was determined using their standard methods (ELISA) following the guidelines and recommendations described in ISO 14675/2003. The criteria for the selection of the farms were: a) the willingness of the farmers to use only clinoptilolite as mycotoxin binder without making any other changes to the rations offered to the animals during the experimental period b) the agreement of the milk industries to determine the AFM1 concentrations in the delivered bulk tank milk at fixed time-points and c) the difference between bulk tank milk AFM1 concentration at the initial measurement and at the onset of the experiment (3–10 days later) not being more than 10 %. In all these farms the total mixed rations offered to the animals were formulated by the attending animal scientists and met the requirements of the cows for maintenance and respective milk production. Herd size, average milk production per cow per day, average daily dry matter intake and farming system are presented in Table 1. The study lasted for 7 days. On Day 0, the bulk tank milk AFM1 concentration was determined. For the next seven days (Days 1 to 7), clinoptilolite was added in the total mixed rations of all farms at the level of 200 g per animal per day. The rate of clinoptilolite supplementation (% of the dry matter of the ration) is shown in Table 1. The bulk tank milk AFM1 was also determined at the delivered milk produced on Day 7 of the experiment. The aflatoxin contaminated feedstuffs in the rations of 12 out of 15 farms, as stated by the farmers that analyzed their feedstuffs in private laboratories on their own initiative are presented in Table 1. The clinoptilolite-rich zeolitic material (Vivolith 85, S&B, Greece) used in all farms contained at least 85 % (85 %–87 %) clinoptilolite according to the analyses provided by the manufacturer for the batches used; the admixtures were feldspar, micas and clays as determined by x-ray powder diffraction. The cation exchange capacity of the material used was 160 mEq/100 g and its chemical composition was as follows: SiO2 68.3 %, Al2O3 12.8 %, Fe2O3 1.1 %, CaO 3.2 %, MgO 0.7 %, K2O 3.4 %, Na2O 1.0 % and loss on ignition (LOI) 8.5 %. According to the size of zeolite, farms were allocated into two groups. The first group (SC) consisted of 9 farms that used a particle size of less than 0.15 mm and the second group (LC) of the other 6 farms that used a particle size of less than 0.8 mm (Table 1). The allocation to these groups was completely randomized. The procedures and the experiment were done according to the ethical standards in the Helsinki Declaration of 1975, as revised in 2000, as well as the national law and the guidelines of our Institutional Animal Care and Use Committee. Data were analyzed using the statistical program SPSS® 21. Normality of data distribution was assessed with Kolmogorov-Smirnov test and homogeneity of variances was evaluated with Levene’s test. Repeated measures analysis was run to evaluate the significance of the differences among the AFM1 concentrations in the bulk tank milk before (Day 0) and after the administration of clinoptilolite (Day 7). Univariate analysis of variance was also used for the comparison of the absolute differences (AD) and the absolute relative differences (ARD) of the AFM1 concentration in milk at the onset and the end of the study period between the two groups (SC and LC) of farms (AD = AFM1o- AFM1F and ARD = 100xAD/AFM1o; where AFM1F represents the milk AFM1 concentration on Day 7 and AFM1o the milk AFM1 concentration on Day 0). Bonferroni test was used as an adjustment factor for the comparison of the main effects of time and group respectively in the former models. The linear association between the milk AFM1 concentrations on Days 0 and 7 was assessed by the use of the Pearson Correlation Coefficient test and Linear Regression Analysis was used to determine the equations predicting the milk AFM1 concentration after clinoptilolite administration. A value of p ≤ 0.05 was considered significant in all comparisons. The sensitivity and the specificity for the correct prediction of individual farms with or without milk AFM1 concentration over 0.05 μg/kg after clinoptilolite administration using the generated equation was calculated using MedCalc Diagnostic test evaluation calculator (available at: https://www.medcalc.org/calc/diagnostic_test.php). The inclusion rate of clinoptilolite in the total mixed rations of the 15 farms included in the study is presented in Table 1. On average, the inclusion rate was 1 % (SD: 0.05) of the ration’s dry matter (DM). As it is shown in Fig. 1, reduced milk AFM1 concentrations were recorded in all farms tested after the dietary inclusion of clinoptilolite (Day 7) compared to Day 0. On average, milk AFM1concentration on Day 7 was significantly lower compared to Day 0 (mean ± SE: 0.078 ± 0.0074 μg/kg and 0.036 ± 0.0061 μg/kg for Days 0 and 7, respectively, P < 0.001). Moreover, the average AD was 0.04 μg/kg (SD: 0.01) and the average ARD was 56.2 % (SD: 15.11). In farms of the LC group the average AD of milk AFM1 concentration was significantly higher than that in farms of HC group (mean ± SE: 0.046 ± 0.0074 μg/kg and 0.036 ± 0.0061 μg/kg for groups LC and HC, respectively, P = 0.002; Fig. 2). However, the average ARD was not significantly different among groups (mean ± SE: 58.1 ± 13.15 % and 53.2 ± 18.6 % for groups LC and HC, respectively, P = 0.56). where AFM1F represents the milk AFM1 concentration on Day 7 and AFM1o the milk AFM1 concentration on Day 0 (Fig. 3). The sensitivity of the correct prediction of individual farms with or without milk AFM1 concentration over 0.05 μg AFM1/kg after clinoptilolite administration using this equation was 100 % and the specificity was 90.91 %. The objective of the present study was to evaluate the efficacy of a natural zeolite; clinoptilolite, as aflatoxin binder in dairy cattle. It was selected to run the study in natural cases rather than experimentally induced aflatoxicoses which is the common practice in most of the studies [9, 26, 27] evaluating other mycotoxin binders. It was done not only for welfare reasons but also because such a study design would allow us to test the efficacy of clinoptilolite under field conditions and to have a considerable number of replications by using different farms. Besides, the in vitro and the in vivo studies that preceded in other animal species [15, 16, 17, 18, 19, 20, 21, 22, 23] provided enough evidence for potential efficiency of the binder on the reduction of aflatoxins. The criteria of farm selection were set in order to ensure, as most as possible, that the milk AFM1 concentration on day 0 represents a stable situation of high milk AFM1 and that the reductions detected on day 7 are due to the in-feed inclusion of clinoptilolite. The dosage rate of clinoptilolite offered daily to the animals was chosen to be 200 g per animal per day because this amount is safe for long-term consumption and has beneficial effects on the health status and the performance of dairy cows . Furthermore, this daily dose represented the 1 % of ration DM, on average, which is within the rates most commonly used for the evaluation of a mycotoxin adsorbent in dairy cows [9, 26, 27]. According to our observations during a series of experiments , the addition of clinoptilolite at this level in the total mixed rations has no effect on the feed consumption even from the first day of administration. So, no gradual increase of the amount of clinoptilolite fed was judged to be necessary prior to the onset of the evaluation period and the selected daily dose was offered to the animals from the first day of the study. The duration of 7 days was considered to be adequate as study period given that it is about double the clearance time after the removal of aflatoxins of the dairy cattle diet which is about 3–4 days [9, 10, 27]. The results obtained here prove that the dietary administration of clinoptilolite is effective in reducing the milk concentration of AFM1, given the practically stable AFM1 milk concentration from the first detection by the milk industries until the onset of the experiment and the continuous use of the same rations without any change until the end of the experiment. With the exception of the 4 farms where the initial milk AFM1 concentration was higher than 0.1 μg/kg, in all other cases the final AFM1 concentration was below the maximum residue level of 0.05 μg/kg. This indicates that the dosage rate of 200 g clinoptilolite per cow per day, is adequate for the prevention of aflatoxicosis with AFM1 milk concentrations lower than 0.1 μg/kg. The average relative reduction of milk AFM1 recorded at this study, although not comparable with other experiments due to different study design, was similar to those achieved with other aluminocilicate mycotoxin binders; Diaz et al. observed that calcium and sodium bentonite products reduce milk AFM1 concentrations by 31 % to 65 % and Kutz et al. that two hydrated sodium calcium aluminocilicates decrease the AFM1 by 45 and 48 %. The relatively high standard deviation, about 25 % of the means, of the AD and the ARD recorded is probably due to the wide range of initial milk AFM1 concentrations, to the large variation of the carry-over rate of AFB1 to AFM1 in milk [8, 9, 10, 11] and to the differences of the rations offered to the animals among farms. The use of clinoptilolite-rich material with the particle size of less than 0.15 mm resulted in significantly higher decrease of milk AFM1 concentration than the one of less than 0.8 mm. Due to the porous nature of clinoptilolite, the smaller particle size provides a larger surface that is available for interaction with the polar mycotoxins such as aflatoxins . So, the <0.15 mm clinoptilolite adsorbed higher quantities of AFB1 in the gastrointestinal tract than the <0.8 mm one. The absence of significant difference on the average absolute relative reduction between groups is associated with the higher average milk AFM1 concentrations recorded on the LC group compared to HC. Another interesting finding was the strong linear relationship among the initial and the final AFM1 milk concentration and the high value of the coefficient of determination of the regression equation produced. The very high sensitivity and specificity values determined denote that using this equation it is possible to predict whether the milk AFM1 concentration will be lower than the maximum residue level of 0.05 μg/kg or not. If not, the simultaneous use of another aflatoxin binder or the administration of higher amounts of clinoptilolite should be considered given that the adsorption of aflatoxins by aluminosilicate binders occurs in a dose dependent manner . Besides, higher daily doses of clinoptilolite than 200 g in dairy cattle are safe even for long-term administration . In the context of this study it can be concluded that the dietary administration of clinoptilolite, especially of smallest particle size, can effectively reduce milk AFM1 concentration in dairy cattle. Taking into consideration the relatively low commercial price of clinoptilolite (0.30-0.40 Euros per kg) and that the long-term dietary supplementation of clinoptilolite is safe and has beneficial effects on the health status and productivity of dairy cattle, without adding any extra labour in the farm’s routine, clinoptilolite feeding at the rate of 200 g per cow per day can be used as a preventive measure for the amelioration of the risks associated with the presence of aflatoxins in the milk of dairy cows. Of course, further research using higher inclusion rates of clinoptilolite is regarded necessary in order to evaluate its efficacy when bulk tank milk AFM1 levels are higher than 0.1 μg/kg. AFM1, aflatoxin M1; AFB1, aflatoxin B1; LC, clinoptilolite with <0.15 mm particle size; HC, clinoptilolite with <0.8 mm particle size; SD, standard deviation; SE, standard error; AFM1F, milk aflatoxin M1concentration on Day 7; AFM1o, milk aflatoxin M1 concentration on Day 0; AD, absolute differences; ARD, absolute relative differences; DM, dry matter; DMI, dry matter intake; FS, free stall; CEP, Cubicle with earthen paddocks. PDK and MAK contributed in conceiving the idea, designing of the experiment, collecting the data, statistical processing and drafting the manuscript. CB and PW contributed in designing the study, interpreting the results and revising the manuscript. HK designed and supervised the study and critically revised the manuscript. All authors read and approved the final manuscript.